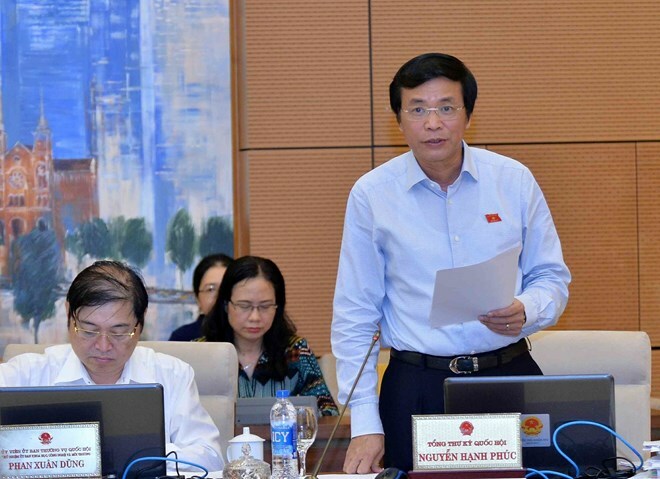 according to NA Secretary General Nguyen Hanh Phuc. At the ongoing 33rd meeting of the NA Standing Committee on April 16, he said the agenda of the approaching session is set to include four more draft laws. They consist of a draft law amending and supplementing some articles of the Law on the Organisation of the Government and the Law on the Organisation of Local Administration, a draft law amending and supplementing some articles of the Law on Cadres and Civil Servants and the Law on Public Employees, a draft law amending and supplementing some articles of the Law on State Audit, and another amending and supplementing some articles of the Law on Insurance Business and the Law on Intellectual Property. Meanwhile, three other drafts were proposed to be excluded from the agenda, namely the draft revised Law on Medical Examination and Treatment, the draft law amending and supplementing some articles of the Land Law, and the one amending and supplementing some articles of the Law on Investment and the Law on Enterprises. The proposed withdrawal aims to give relevant agencies more time to perfect the drafts, Phuc said. Regarding question-and-answer (Q&A) activities, NA Vice Chairwoman Tong Thi Phong said that at the parliament’s last session in late 2018, the questions raised covered all fields and all ministers had to field deputies’ queries. However, she said, this was not really necessary. She proposed that Q&A activities be carried out in the previous manner, which meant suggesting topics for deputies and ministers to focus on.